Sold in pairs! high quality terry cloth cotton, available over 17 in different colors – now in neon colors! 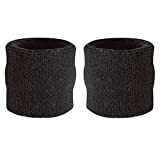 Available in 17 different colors – Wrist sweatbands are great for sporting events. The wristbands work to prevent sweat from affecting your game. They also have a very stylish look to them and are comfortable to wear. The sweat wristbands are made of very high quality cotton, making them perfect for people in athletics, musicians and more. This entry was posted in Tennis and tagged Pair, Striped, Suddora, Sweatbands, Wrist by FPSports. Bookmark the permalink.